Extremely important Skittle sorting prior to making Skittle vodka, which was amazingly tasty and alarmingly drinkable. Especially the orange flavour. We passed the cheap and nasty vodka through a Brita charcoal filter before infusing it with the Skittles, which I think made a bit of a difference. It certainly made a difference to our filtered water for the next couple of weeks as it had a bit of a vodka flavour until we got around to changing the filter. Yeah, soldering that onto the breakout board was quite tricky. The main body of the chip (the black bit) is only 1.75 by 1.3mm big. I haven't got around to doing any more than that, so it's in the pile of ideas and half-completed projects. Yes, that is quite a lot of LEDs. I did this for a test of my still-in-progress sunrise alarm clock that I started back in October and now will almost certainly not get around to finishing before winter is over rendering the whole thing completely unnecessary. Ahh, but it looks so pretty. This is our amazingly spectacularly awesome almost finished shed we've built on our allotment. Hewn from a pile of pallets, scrap plywood and doors, with bonus store damaged roof sheeting from B&Q. Doors make remarkably good walls, so we're not expecting to have to replace this in the near future. Anyway, we now (well, ironically, when we put a door on it) have somewhere to store all our tools and various other bits of gardening equipment that we've accumulated already. Interestingly, the parts where there isn't any Kapton tape show up as much cooler - not because they are any cooler but because the bare metal is reflecting an IR image of the cold window. Anyway, the heater seems to work pretty well as Iain's reprap is churning out all sorts of interesting stuff. This is a clone of Adafruit's Mintyboost that I made to take to Glastonbury last year to keep my phone charged. It's basically the suggested schematic and layout from the LT1302 step-up converter. It turned out pretty well - I like that its not much bigger than the two AA cells it runs on. Could do with a nice 3D printed case for the component side perhaps. Performance wise, it was a bit disappointing. I think that was quite a lot to do with the crappy batteries we took with us and that were available on the site. I didn't actually test it very much. At some point, I'll get around to doing a proper test with various batteries. Got this squirrel at the farmers market and later made a very tasty casserole from it. Not a huge amount of meat on it but has a good flavour. Unnecessarily robust reclaimed pallet-wood table, built for our allotment. 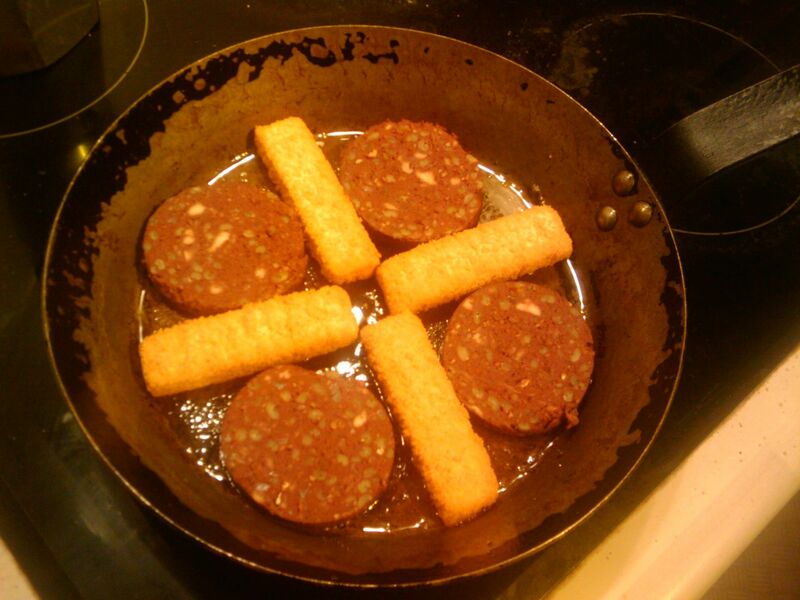 Optimal use of frying pan space when making fish finger and black pudding sandwiches. 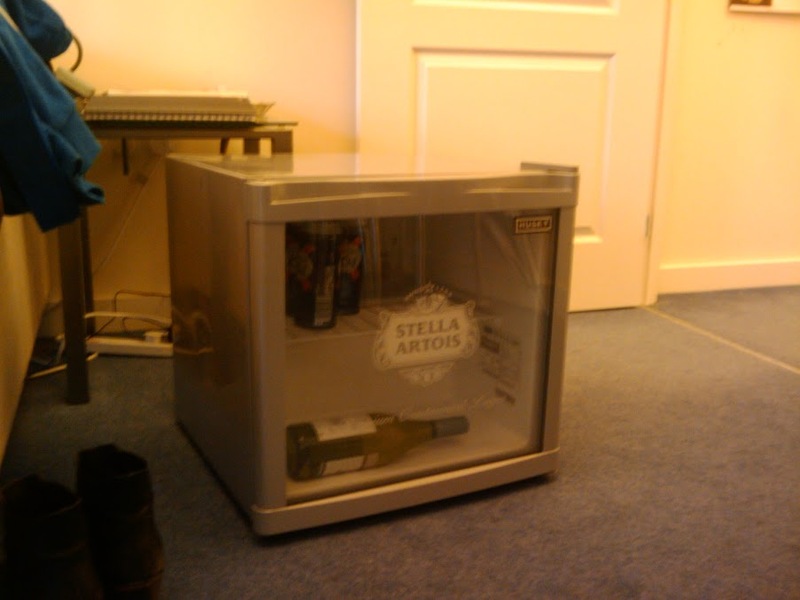 This is an Arduino-based thermostat I made for the beer fridge that Tina found in the rubbish outside our flat. It worked fine for a few months and then stopped - the mechanical thermostat had crapped out. Coincidentally, I had a thermocouple and a MAX6675 thermocouple amplifier hanging around that I'd purchased with my Sparkfun free day winnings so I threw this together and installed it into the space where the old thermostat had been. Since I had heaps of I/O pins left I added a 7-segment display to display the temperature on the front of the fridge. It works great, and is currently installed at Cardiff Hackspace, cooling our beers.